Bottles of aperitifs on display at a shop in Gourdon village in Provence, France in Europe. ... 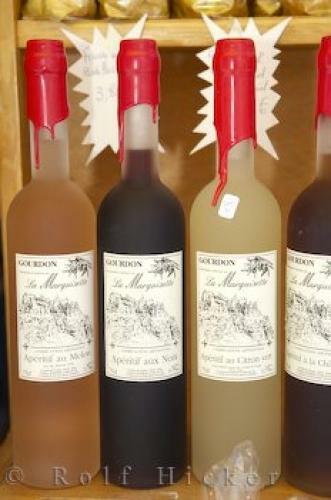 There is a great selection and the store owner will be able to help if needed.Bottles of Aperitif's at a shop in the village of Gourdon, Alpes Maritimes, Provence, France, Europe. I photographed this photo with the digital SLR camera model Canon EOS-1Ds Mark II, aperture of f/5.0, exposure time of 1/60 sec. on ISO 100, as always I used a original Canon Lens, the focus lenght for this picture was 60mm.